Mort Künstler Handsigned and Numbered Limited Edition 2009 Snow Print:"Gray Ghost, The"
Edition Size: Artist Signed and Numberd with COA to 350 prints with 50 AP's. Canvas limited to 10 Artist Proofs. Medium: Fine Art Prints on Paper and Giclee on Canvas Editions. This year the paper prints feature the Mosby Heritage Area Association's* seal. Image Dimensions: 25" x 21" Print and Canvas Sizes 27" x 23". About the Art: Following the Confederate Congress's Partisan Ranger Act of 1862, Major General J.E.B. Stuart appointed one of his most gifted scouts, First Lieutenant John Singleton Mosby, to lead the 43rd Battalion Virginia Cavalry. "Mosby's Rangers," as they would be called, were formed that following January as the winter of 1863 blanketed the Virginia countryside. On the 18th of that month, while en route from Fredericksburg to Upper Fauquier, Mosby and fifteen men detached from the 1st Virginia Cavalry stopped off in the town of Warrenton to dine at the renowned Warren-Green Hotel. In November of 1862, Union General George B. McClellan had bid his troops farewell on the steps of this tavern after being relieved of his command by President Abraham Lincoln. This evening however, the Warren-Green witnessed the birth of a new command whose reputation would grow to epic proportions. This unique group represented twelve native Virginians and three Marylanders who had been handpicked by Mosby himself. They formed the original nucleus of "Mosby's Rangers," and together they would provide intelligence for the Army of Northern Virginia, while also causing disruptions along the Union army supply lines. Their unique ability to evade Federal pursuers earned their commander the nickname of "The Gray Ghost," as he and his troops appeared to vanish whenever they ventured into harm's way. Mosby himself recalled their unique mission when he wrote, "My purpose was to weaken the armies invading Virginia, by harassing their rear... to destroy supply trains, to break up the means of conveying intelligence, and thus isolating an army from its base, as well as its different corps from each other, to confuse their plans by capturing their dispatches, are the objects of partisan war. It is just as legitimate to fight an enemy in the rear as in the front. The only difference is in the danger." After the South's surrender at Appomattox Courthouse in 1865, Mosby begrudgingly disbanded his rangers, vowing to never surrender formally. He later returned to the town of Warrenton to conduct his law practice and often dined at the Warren-Green Hotel. Mort Künstler's Comments: It has been ten years since I last painted the beautiful Warrenton County Courthouse featured in "The Bravest of the Brave." In addition, it has been twelve years since I last painted John Singleton Mosby in "While the Enemy Rests." That is much too long, in my opinion. I felt it would be wonderful if I could combine both subjects in one painting. Placing Mosby in Warrenton was easy because he operated often out of that area. But there were still a number of obstacles. I wanted to capture a significant moment in his storied career and I also wanted a snow scene. I learned that his first independent command was formed in Warrenton and his original fifteen men stopped off at the Warren-Green Hotel for dinner on January 18, 1863. By moving my viewpoint around to what is now the Alexandria Pike, I realized that I would not only get a very different angle of the Courthouse from the previous painting, but I could also get the Warren-Green Hotel in the background. I quickly called my good friend and colleague, Dr. James I. Robertson, Jr. and was delighted to learn that it was indeed a bitterly cold windy day that had turned everything white and icy. This gave me my snow scene. With this newfound knowledge I imagined the difficulties of getting up the hill on the Alexandria Pike, facing the front of the Courthouse. Although they plowed the roads with horse drawn equipment, wagons and carts would have been rendered immobile and abandoned. The trees around the Courthouse today almost obliterate the building from view on Alexandria Pike, so painting the structure accurately was very challenging. Historian Richard Deardoff of Warrenton was of great assistance with research for this painting. As the men rode up the hill on Court Street alongside the Courthouse, none of them could have imagined the unparalleled success and fame that would subsequently come to the young lieutenant. Mosby himself could not have foreseen the reputation he would gain. I feel a great sense of satisfaction from this painting, as I was able to combine all of the desired elements into a single image. 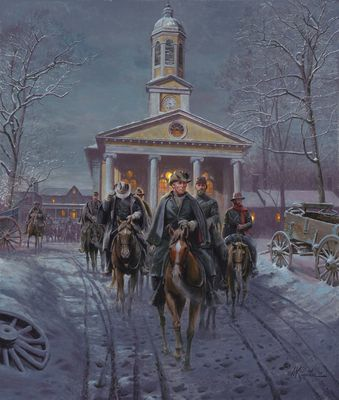 This includes placing "The Gray Ghost" and his men in front of the Warrenton County Courthouse, on a significant date in their formation, in the beautiful Virginia snow. This year the paper prints feature the Mosby Heritage Area Association's* seal, which is sure to make it a highly collectible print. *The MAHA's mission is to promote the preservation of the historic, cultural and scenic resources of the Mosby Heritage Area.